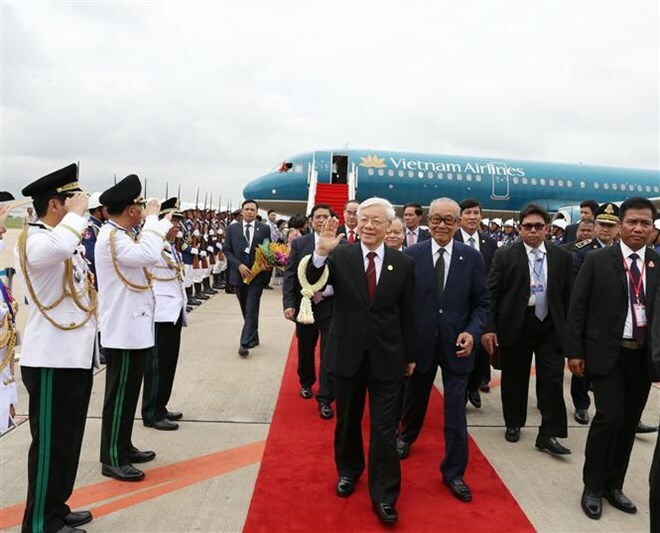 Phnom Penh (VNA) – Party General Secretary Nguyen Phu Trong arrived at Pochentong airport in Cambodia’s capital city Phnom Penh on July 20 morning, beginning a State-level visit to Cambodia from July 20-22 at the invitation of King Norodom Sihamoni. The Party leader and his entourage were met at the airport by Cambodian Deputy Prime Minister and Minister of the Royal Palace Samdech Kong Som Ol, Deputy Prime Minister Men Som On, and officials from the Royal Palace, the Foreign Ministry and the Cambodian People’s Party. Crowds of people, including overseas Vietnamese in Cambodia, were also present at the airport to welcome the Vietnamese Party leader. Party General Secretary Nguyen Phu Trong’s visit, the second state-level visit to the neighbouring nation by the Party leader, is made on the occasion of the 50th anniversary of diplomatic ties (June 24) and in the context of sound overall relations. It aims to promote trust between the Communist Party of Vietnam (CPV) and the Cambodian People’s Party (CPP) and speed up the implementation of agreements signed between the two nations.